A mudaraba contract is one of the most widely used financial instruments in the Islamic banking sector. A mudaraba contract is based on a partnership in which one partner is the financier (the investor, or silent partner) and the other partner (the fund manager, or working partner) manages the financier’s investment in an economic activity. The second partner (often an entrepreneur) has expertise in applying the venture capital into the economic activities. Both parties agree in advance to a profit and loss sharing (PLS) ratio. In Arabic, the investor is called rab al mal, and the fund manager is called the mudarib. In this contract, the basic factors of production (from the Islamic economics viewpoint) — capital, labor, and entrepreneurship — are combined to make an economic activity. The rab al mal provides the capital, and the mudarib provides entrepreneurship and labor. The mudarib gets a portion of the profit for his effort, and the rab al mal gets the remaining profits. All mudaraba contracts are limited by a specific time period; they don’t continue indefinitely. Mudaraba contracts can also serve as a source of funds for an Islamic bank. When customers deposit money and expect a return, they’re the arbab al mal (the investors), which is the plural form of rab al mal. The bank is the fund manager or working partner — the mudarib. The bank invests the depositors’ money according to sharia guidelines. Restricted mudaraba (mudaraba al muqayyadah): The investor specifies a particular business or project where the investment funds are to be used; the working partner should not use the funds for any other business or project. Unrestricted mudaraba (mudaraba al mutlaqh): In this mudaraba contract, the investor gives the working partner permission to funnel the funds into any type of business or project that best suits the financial goals of both partners. When a mudaraba contract is used as a source of bank funds (when the customer deposits money in the bank), the unrestricted mudaraba is most often used. When the contract supports a bank’s equity financial product (when the bank supplies funds to a working partner), the restricted mudaraba is most often in play. With mudaraba contracts, the rab al mal and the mudarib share profits and losses based on an agreed-upon ratio. The mudarib (manager or working partner) also receives a fixed fee for managing the project, in addition to a share of any profits. If the economic venture results in a loss, that loss is absorbed solely by the investor as the capital provider unless the mudarib (fund manager) has acted negligently or has engaged in misconduct. Here is a visual of how the mudaraba contract works as a financial instrument. The bank on its own doesn’t have the capacity to serve as the investor (the rab al mal). This scenario may mean that the bank doesn’t have enough liquidity to enter a mudaraba contract with an entrepreneur or fund manager. The bank lacks the expertise to serve as the fund manager (mudarib) for an investment. In both cases, the two-tier contract allows the bank to create a link between investors and an expert fund manager or entrepreneur so the economic activity can take place. The two-tier method of mudaraba is less frequently applied than the first-tier method. That’s because banks usually have the liquidity and/or expertise to enter into a first-tier contract and because the two-tier method isn’t quite as profitable for the bank as the first-tier method. One between the depositor as investor (rab al mal) and the bank as a fund manager (mudarib): The depositor signs a contract with the bank for a two-year sharia-compliant project. The investor and the bank agree to share the profit in a 60:40 ratio (60 percent of profit goes to the investor and 40 percent to the bank). The investment made by the depositor for this specific project is $1 million. One between the Islamic bank serving in the capacity of investor (rab al mal) and the project client as the working partner (mudarib): This contract indicates that the two parties will share the profit on a basis of 70:30 (with the Islamic bank getting 70 percent and the client getting 30 percent). Assume that the client isn’t making any capital contribution but is instead investing time, effort, and expertise in the project. The project earns $1.5 million by the final contract date. 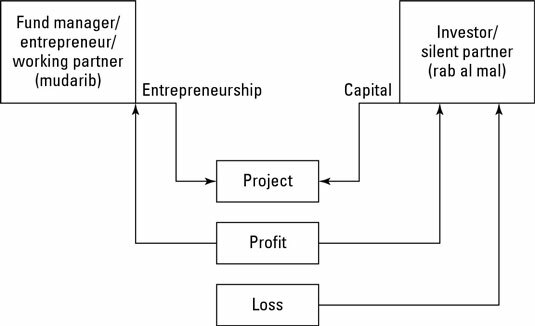 The fund manager or entrepreneur gets 30 percent of the profit, or $150,000, based on the second contract. The bank recovers the capital of $1 million plus a $350,000 profit. The $1 million principal is returned to the initial investor, along with 60 percent of the bank’s profit from the second contract. ($350,000 x 60 percent equals $210,000.) The bank holds onto the remaining 40 percent of $350,000, or $140,000. So the bank earns $140,000 for serving as intermediary between the depositor and the entrepreneur.